Paul Albritton demonstrates work zone safety. It was a warm day for early March. Twenty-two county pub­lic works employees were in a meeting room at the Hamil­ton County Courthouse in Webster City, Iowa, attending a Flagger and Work Zone Safety training session. The training is important, even for this group of mostly veteran workers, because many would soon be working on county roads, often with cars and trucks zipping by. The traf­fic control flagging principles and work zone safety training they received is designed to help keep them and drivers safe. 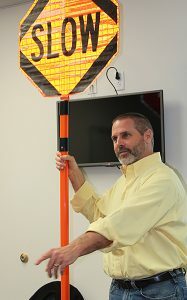 “The training is required for those who do the actual flag­ging and recommended for all other road workers,” said Paul Albritton, technical training coordinator with the Iowa Local Technical Assistance Program located at Iowa State University’s Institute for Transportation. Flaggers learn, for example, what to wear, how to stop and release vehicles, and how to handle emergencies. However, all road maintenance workers benefit from the instruction. Iowa LTAP is managed through InTrans under an annual contract administered by the Iowa Department of Trans­portation. It began in 1983 as the Rural Technical Assistance Program, one of 10 original such programs funded by the Federal Highway Administration. LTAP’s goal today is the same as 1983: bring many types of transportation technology to Iowa’s public works and county employees to improve their knowledge and skills. LTAP staff develop workshops on topics such as bridge inspection, sign and pavement markings, and motor grader operation. LTAP staff also assist other groups, such as Iowa’s county engineers, with professional development events. LTAP offers two professional development programs, the Public Employees Leadership Institute (see adjacent story) and the Roads Scholar Program, which promotes continu­ing education among transportation workers. Road Schol­ars take courses and workshops to earn up to four levels of achievement, the highest of which is the Elite Roads Scholar. Each level is a significant accomplishment, Knapp says. Iowa LTAP recently began a new Iowa traffic safety effort. The Statewide Multi-Disciplinary Safety Team (MDST) pro­gram is a coordinated effort between LTAP, the Iowa DOT, and the Iowa Governors Traffic Safety Bureau to facilitate communication and collaboration among Iowa’s regional MDSTs. The regional groups consist of local city and county officials, law enforcement, and others who help identify and address local transportation issues, including identifying and mitigating the causes of crashes. Technical information from LTAP is also available through various media. In addition to a quarterly newsletter, LTAP’s Stan Ring Memorial Library, named for a former Iowa LTAP director, has a growing collection of printed materials, DVDs, online content, and recorded webinars. Of course, information is also available by simply contacting one of the LTAP staff. The Iowa Local Technical Assistance Program works with its partner organizations to help some Iowa public works employees better prepare themselves for leadership posi­tions. The Public Employees Leadership Institute provides a convenient way for new supervisors and those wanting to someday move into management positions to gain valuable skills and enhance their leadership qualifications. The Leadership Institute offers 14 self-paced online courses on topics such as supervisory and leadership skills, legal issues, emergency management, finance, and project man­agement. The content is targeted for city, county, or state agency workers, but most of the courses are applicable for employees in almost any business. The program is a joint effort of Iowa LTAP, the Institute for Transportation at Iowa State University, and ISU Extension and Outreach, with support and assistance provided by the Iowa chapter of American Public Works Association and the Iowa County Engineers Association. The APWA has accred­ited the institute.